In this debate about personalities and the entitlement to grace the cover, here’s a thought. I’m suggesting that the cover not feature a footballer, but one of the planet’s finest sporting vistas: Adelaide Oval. The heritage-listed scoreboard, the Moreton Bay figs, the grassy slopes, the Eddie Betts (the Honourable Edward A. Betts, to use The Wrap’s name) pocket. I can see it now. With his proven excellence in capturing the spirit of footy grounds, Mike Hugo could do the job (no money has changed hands). Players come and go, but this cathedral (you could include the real one in the background) is so painterly that the book-buying punters (even those of leafy Hawthorn) couldn’t resist. Other nominations: including Swanny, Bob Murphy and Pav. Although I have been a fervent supporter of the BMC (Bob Murphy Campaign) I wish to congratulate Mickey R on bringing sanity back in to the up coming election. I believe that we must stop the anarchists who are destroying the very fabric of society by their absurd comments. I wish to advise that I resign from the BMC and now will put all my efforts in to that magnificent icon of Australian Society the Adelaide Oval. You would certainly have the support of the Coodabeen Champions. They used to rave on about the greatest venue for football in the universe. Well, Greg Champion did while the others were just stirring. Greg got very wistful at the very mention of those Morton Bay figs. Like watching grass grow. 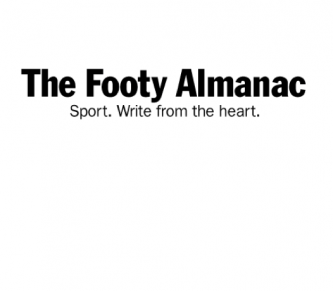 The Almanac cover is the Archibald Prize for portraiture in football art. Heathens. I can never forgive the Sir John Creswell and Mostyn Evans Stands being torn down for Ricciuto. My wife and I stopped over in Adelaide recently and among other things in that attractive city had a guided tour of the Oval. We went from the bowels of the foundations to the old scoreboard to the top of the stands. Great venue. And walked back to the hotel across the $40,000,000 bridge. I’d be happy to see it on the cover. Just to stick it to the Cats fans, I suggest Stevie J in a Giants jumper! An ageing superstar with a club that is a rising power. I wholeheartedly endorse this. Can one footballer truly sum up the spirit of the Almanac? But Adelaide Oval is our stadium, local pub, cathedral, tourist attraction, lounge room, nightclub, concert hall, karaoke bar, Colloseum, picnic park, meeting point and spiritual home… all things to all people. After three seasons she has shed her new toy feel and become, yet again, the sum of the millions who have shared times with her, the tears shed in disappointment or tragedy or just pure joy, the anger, the love and appreciation, the togetherness, the laughs. So kind of like the spirit of the Almanac? Thousands of zealots wearing their heart on their sleeve? Adelaide Oval for the 2016 cover. It’s time. The Ponderosa was used for a preseason game wasn’t it – I’d prefer Goodman Road. Well the tribe has spoken. I’ll add AO to my to-do list. Suggesting RuleBook on the bottom corner to compliment the Adelaide Oval is brilliant. I must agree with Peter B.
John Creswell played such an important role in the birth and development of both cricket and football in South Australia. I can understand why, but it was sad that the name Creswell disappeared when the original stand was demolished and replaced by the Bradman stand. I accept that the latest re-development had to honour footballers in some way – the Barry Robran statue is brilliant. A stand named after Ricciuto? Hmmm. It will take me a while. I would hope that the efforts of Creswell and the likes of Mostyn Evans and Sir Edwin Smith have been recognised in some way, somewhere within the edifice. And, who knows, the next re-development may have a stand named in honour of an elite sporting female. Would Young Malcolm (Rulebook) be more suited to the role of centrefold? Isn’t it more of an oblong, Mickey? Citrus Bob- you can argue that it’s barely still an oval, and now almost a stadium, but there remains some local, arresting beauty. Thanks for your support. Neil- those figs trees are special as Champs attests. They’re the most important feature of the ground. Very few sporting arenas blend the modern and the natural so successfully. PB- fair point! That’s a no? Don- glad you enjoyed the tour. It’s quite an expensive bridge! Hope our broke government doesn’t introduce a toll to re-coup the cost. Oops. RTB- I suspect management may disagree with you, but it’s certainly a story of 2016. Cathryn- love your poetic views. It’s now the spiritual and geographical heart of the city in many ways. When, as a Singapore resident I first visited it during 2014 I wrote on these pages, “The redevelopment is striking, but the best features are those that have not been re-developed: the scoreboard, the hill and the Moreton Bay Figs. Despite the half-billion dollar investment, the historic flora remains iconic.” I still think this. Swish- Ponderosa with Brendan Maguire on the wing? Peter Crossing- agree with many of your thoughts. I guess there must always be omissions. The late Lyn Fullston is officially honoured with the lovely lawns on the western side of the ground. Rulebook- What if Troy turns up at the Blacks next year for a kick and a catch? Phil- I think you’re right, but the marketers over-ruled the name change. Thanks to everyone. It’s a great conversation. I think we’ll all be extra-keen to see the 2016 cover.